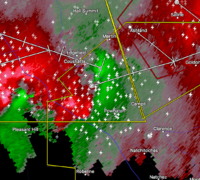 Coushatta, or 13 miles east of Mansfield, moving east at 25 mph. HAZARD...Damaging tornado and golf ball size hail. I presume based on the warning location that this tornado could have gone right through the heart of town. How does the reflectivity look on radar? Any indication that is the case? Yes, it was confirmed moving through Coushatta. Oh that makes me ill. It looked to me like it peaked before town but I am hearing there are reports of damage. There is a TOG outside the slight box headed towards Jarrell TX. Hearing reports of major damage in Coushatta. hours. New watch will likely be issued by 02z. mode is becoming less favorable for discrete structures. Might try to spin back up? 1 NW Vicksburg [Warren Co, MS] AMATEUR RADIO reports FLASH FLOOD at 6 Apr, 8:15 PM CDT -- NUMEROUS ROADS ARE CLOSED IN VICKSBURG DUE TO FLASH FLOODING. That's some down right NASTY hail cores near Nachitoches! moving southeast at 25 mph. Colfax around 955 PM CDT. Chopin, Cloutierville, Melrose and Aloha. Hermanville around 925 PM CDT. Peyton around 935 PM CDT. Barlow around 945 PM CDT.